Ken Wells, a seasoned business journalist, watched print news outlets evolve from traditional printing presses to the Internet’s 24-hour news cycle. At the first newspaper where Wells worked in Bayou Black, Louisiana, he used to run downstairs and smell the ink of the first papers coming off the press. In today’s world, he considers himself agnostic on which medium to use for publication, as long as people continue to tell these news stories. “The best business stories aren’t about business,” Wells said. “But about their use as an interface for the human condition.” Photo by Alyssa Rabil. Yet when Wells first started college, he didn’t dream about becoming a journalist. “I liked biology, and my father was a marine, so I decided to become a marine biologist,” Wells said. He quickly became disillusioned with his classes and dropped out of college. Wells started working as a short-order cook at a 24-hours diner, but he quit that job after intervening in a late-night fight between customers. “I decided that breaking up attempted murder for minimum wage was not a good career,” Wells said. He found an ad in his hometown newspaper, the Houma Courier, that read “Wanted: Part-Time Reporter, $1.87 / hour.” After the Courier hired Wells, his editor sent him off with a Polaroid camera to report on a bartender who had caught a 300-pound snapping turtle. Wells spent several years at the Courier before getting his master’s degree at the University of Missouri School of Journalism in 1977. From there, Wells worked at the Miami Herald, The Wall Street Journal and Bloomberg News. During the question and answer session at the end of the lecture, second-year graduate student Andrew Graham asked Wells about approaching his first non-fiction books after his lengthy career writing for newspapers. Learn more about Ken Wells’ work as a journalist, author (fiction and non-fiction), photographer and musician from his website. 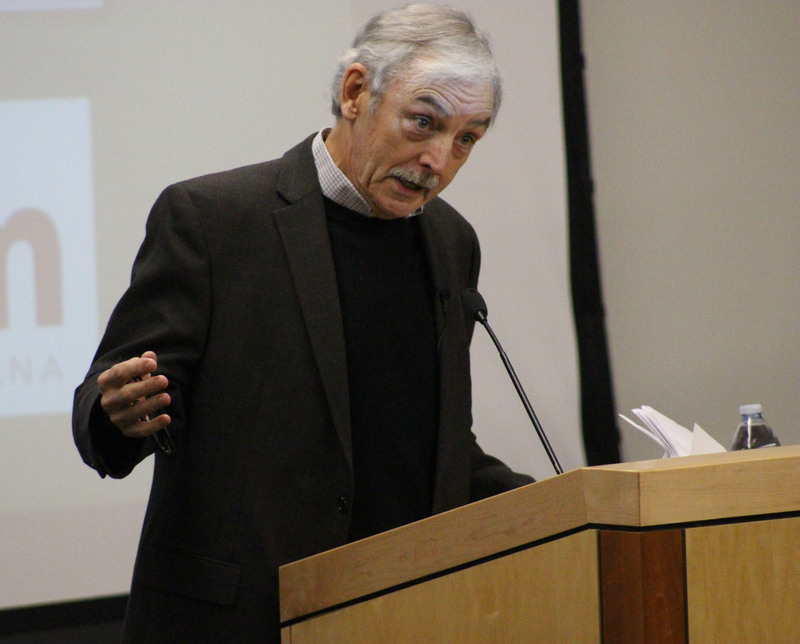 To catch up with live coverage of Ken Wells’s delivery of the annual Jeff Cole Distinguished Lecture, follow the University of Montana School of Journalism’s Twitter and Instagram accounts.